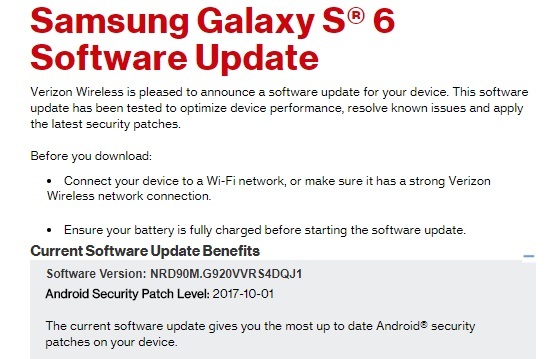 In addition to rolling out October security patch update for Galaxy S8 and S8+, Verizon is also pushing a new update for Samsung Galaxy S6 and S6 Edge. The new update brings the October security patch to both the devices. Unlike Samsung Galaxy S8 and S8+ that have received a patch for Krack vulnerability, S6 and S6 Edge changelog doesn’t mention Krack. So, we are not sure whether the update brings it or not. For the unaware, Krack is a security vulnerability in all the Wi-Fi connected devices viz. computers, phones, tablets etc. Regardless, the October security patch will take care of other security vulnerabilities on your device. There will be under the hood performance improvements and bug fixes included in this update. While the previous software updates that brought Blueborne security patch had version number G920VVRS4DQI1 and G925VVRS4DQI1 for Galaxy S6 and S6 Edge, the new update raises the version numbers to G920VVRS4DQJ1 and G925VVRS4DQJ1 for Galaxy S6 and S6 Edge respectively. Since it is an OTA update, it may take some time to reach your device. You will get a notification once the update reaches your device, meanwhile, you can check the update manually too. Just go into Settings – About – Software. Sadly, Samsung Galaxy S6 and S6 Edge are still on Nougat 7.0. Hopefully, they will be updated to 7.1, but we are sorry to inform you that none of these devices will get Oreo. There, we said it! On the bright side, Samsung has started rolling out Android Oreo beta build for its Galaxy S8. You can join the beta program here. However, Verizon users are currently not eligible for the beta program but there’s a simple method with which you can install Oreo on your Verizon S8. Check it here. Meanwhile, other OEMs have also started their Oreo rollout. OnePlus has pushed a beta build for OnePlus 3 and OnePlus 3T while Nokia has launched the Android 8.0 Oreo beta program. In addition to that, even Huawei has started rolling out Oreo beta for Honor 9 and the Honor 8 Pro.